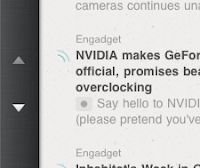 The top use of my iPad is reading the tech news - through RSS feeds. There is an excellent RSS reader for the iPad called Reeder. easy to step through articles. there are scroll buttons on at the left edge in the middle of the screen; I first wondered, why they had been position there, but once you get used to holding the iPad in landscape mode, this is exactly the position where your left thumb is... tricky,ey ? it's a lean back experience. This - to me - is new for news consumption via feeds and I really prefer it over the laptop / desktop experience. Quick summary: perfect feed reader on the perfect news device.